Hydraulics have won wide acceptance for factory and mobile applications. Traditional strengths of this key technology are centered around power… strength… durability… control. But now, new lines of research are focusing in on efficiency. Check these developments that aim to convert hydraulics from energy-gulpers to dainty sippers. 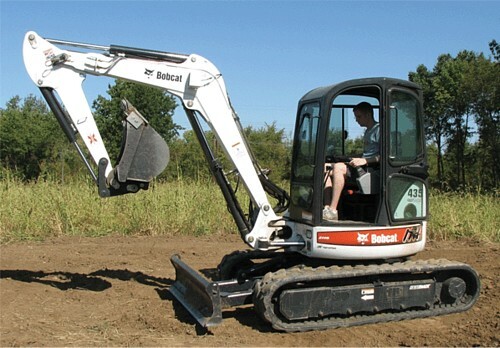 Small excavator used to test pump-controlled actuation, in which traditional flow-control valves are replaced by with variable displacement pumps. Most mobile hydraulic systems are powered by diesel engines, and they may use more diesel fuel than they have to. A research project at Purdue University, sponsored by the National Science Foundation (NSF) and the National Fluid Power Association (NFPA), is working to test a method for using less power in mobile hydraulic systems. In a nutshell, the method replaces traditional flow control valves with variable displacement pumps. Rather than connecting multiple hydraulic actuators (cylinders and motors) in parallel to a single pump, each actuator is controlled by smaller, individual pumps. The researchers call this “pump-controlled actuation” or PCA. This approach offers lower power losses and the ability to recover energy, during such tasks as lowering a load. PCA systems also have sufficient flexibility to adjust engine speed and pump displacements to keep the engine operating near its peak efficiency, a technique that is familiar for hybrid vehicles but has not yet been applied to construction machinery. These developments promise to dramatically reduce fuel consumption while simultaneously introducing more sophisticated electronic controls that will improve operator comfort and productivity. This research is currently being conducted by graduate students Chris Williamson, Josh Zimmerman, and Edward Hughes at Purdue University as part of the Center for Compact and Efficient Fluid Power (CCEFP), a consortium of seven universities and more than 40 companies devoted to advancing the state of the art in hydraulic and pneumatic technology. The project focuses on a compact excavator, although the PCA method is applicable to other machines with multiple actuators that operate simultaneously, such as telehandlers, timber harvesters, and so forth. Detailed simulations have shown that the main source of power loss on these machines is the flow control valves. Common “load-sensing” hydraulic systems attempt to reduce these losses, but are still highly inefficient when multiple cylinders and motors operate simultaneously at different pressure levels. Unfortunately, these machines move multiple actuators almost constantly. The Purdue team’s analysis of a 5-ton mini excavator during a typical trenching cycle showed that only about 15% of the engine energy was expended in useful work, and more than 40% of the engine energy was dissipated in valve losses. Pump-controlled actuation eliminates these losses, resulting in a 30 to 40% reduction in total energy for the same duty cycle. The research team is in the process of building a prototype to confirm these findings. The primary goal is saving fuel, but they also intend to demonstrate other advantages of advanced control systems such as cylinder coordination (for level-bottom trench digging) and manipulator motion optimization. Another CCEFP project at Georgia Tech focuses on force-feedback controls for improving the operator-machine interface. Industry feedback is cautious on the project so far, citing the increased cost and complexity of adding more pumps to mobile equipment. The researchers respond that these costs diminish with economy of scale and are outweighed by the benefits of higher efficiency and productivity. As the costs of energy continue to rise, this could be an economical solution to the energy problem. Waste Management Inc. is field-testing the first prototype parallel hydraulic hybrid truck to be deployed in a waste collection vehicle. Four parallel hydraulic hybrid-diesel collection trucks have been incorporated into Waste Management’s fleet and are being tested in Fort Worth to optimize the hybrid system’s efficiency and reliability. Hydraulic hybrid vehicle stores braking energy in the accumulator, then retrieves it when the truck pulls forward. Hybrid vehicles hold great promise for the waste industry because collection vehicles have many cycles of braking and acceleration along a given route. The four Peterbilt 320 vehicles in Fort Worth use a Hydraulic Launch Assist system developed by Eaton Corp. to capture and store energy during braking, which not only improves efficiency but reduces wear on break pads. The stored energy is then transferred to accelerate the vehicle to the next pickup location, reducing fuel consumption and wear on the engine. Design World first reported on these hydraulic hybrid vehicles in our July, 2007 issue. Though hybrid technologies have been successfully deployed in automobiles and light trucks, Class 8 vocational vehicles, a category that includes waste trucks, pose additional challenges to hybrid engine design. Among the largest vehicles on the road, Class 8 vehicles require a robust drive train that can handle heavy loads, and have multiple systems – for compaction and lifting – that draw power from the engine, complicating hybrid design. “We look forward to partnering with Waste Management as they take this important next step in field testing,” said Ruppert Russoniello, VP and GM of Eaton’s hydraulics business. “Waste collection vehicles present a huge opportunity for the environmental benefits created by Eaton’s hydraulic hybrid technology.” Eaton is also working with the U.S. Army to develop hydraulic hybrid vehicles for military uses.